Mojácar - A very picturesque and romantic resort town in Almería province, south-eastern Spain. The streets are cobbled and the houses white-washed, situated on a hill overlooking clean, sandy beaches and the warm, blue Mediterranean sea. The town is an ancient, Moorish fortress which is unspoilt and a favourite venue for artists and writers, plus holiday-makers. This modern property is located in Mojacar, right by the sea and close to Mojacar Beach. Residence Pierre & Vacances Mojacar Playa features multilingual staff, laundry facilities, and a garden. Wireless Internet access (surcharge) is available in public areas. The shops, restaurants and entertainment are a few steps away and only a small street separates the residence and the beach. An outdoor pool with a shallow end for children is available for the whole family. Overlooking Descargador beach, Mojácar Playa holiday apartments are spacious, newly furnished and come with terraces facing the sea. On the Mojácar coast, with the best micro-climate in Spain, the Hotel offers gorgeous views of the blue Mediterranean. The ideal spot to enjoy these quiet beaches or to let sport bring you into contact with nature. The hotel reopened its doors in the summer of 2008 after a complete renovation of its facilities. Warm colours, the comfortable and cosy atmosphere of its rooms and improved exteriors in all respects beckon you to visit. Your stay can be rounded off with a refreshing dip in the hotel pool or working in the well-equipped rooms of the magnificent conference centre. The bright rooms with terraces over the sea invite guests to enjoy the enchanting beauty of their surroundings. We recommend you try the exquisite fish and rice dishes of the cookery of Almería. No other corner of Andalucía can boast such a rich and close heritage with their Moorish past as does Mojácar. With her exceptional situation as a lookout dominating the surrounding terrain, Mojácar has been settled by many and varied peoples since antiquity. Populated since the bronze age around 2000 BC, soon traders such as Phoenicians and Carthaginians arrived to serve the growing communities. Under Greek dominion, the settlement was called Murgis-Akra, from whence came the latinized Moxacar, the Moorish Muxacra and finally the current name of Mojácar. The north African moors established themselves in Spain in the early VIII century and the province of Almería became firstly under the authority of the Caliphate of Damascus and later on was ruled from Cordoba. Under this second enlightened rule, Mojácar quickly grew in size and importance. With the coronation of Mohammed 1st in Granada, Mojácar and its lands became incorporated into the Nazari sultanate, and the town found itself on the frontier with the Christian forces to the east. Watchtowers and fortresses were built or re-enforced during the XIV century, which nevertheless did little to discourage Christian incursions and fierce battles like the bloody event of 1435 where much of the population of Mojácar was put to the sword. On June 10th, 1488, the leaders of the region agreed to submit to the Christian forces, although Mojácar's alcaide refused to attend, considering his town to be already Spanish. At that time occurred the well-known meeting at Mojácar's Moorish fountain, where a pact of free association between the local Moors, Jews and Christians was agreed to. 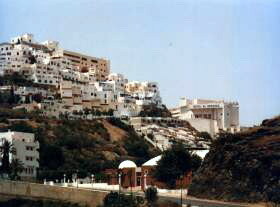 Mojácar once again began to expand until the early XVIII century, when the census of the time recorded 10,000 souls. Around the middle of the XIX century, Mojácar began another period of decline. The records state that several severe droughts brought about this drop in the town's fortunes, with a consequent emigration to northern Spain, Europe and South America. The depopulation of Mojácar was reaching worrying proportions by the 1960's when tourism began to reverse the trend. Today, Mojácar remains loyal to her past with her architecture, the whitewashed houses and the openness of her subjects, who inherited the ways of understanding and sympathy from their forebears. Perhaps one result of this continuous mixing of cultures and religions is the INDALO - or 'Mojácar man'. This magical totem brings protection and good luck, and from times past was always painted onto the fronts of houses once the whitewash was dry: keeping away the 'evil eye' and protecting those within from storms. The figure might be interpreted to be a man holding a rainbow between his outstretched arms. The original totem is thought to be around 4,500 years old, and the earliest known one appears among other prehistoric paintings in a cave in Velez Blanco. The name, Indalo, is recent, and was coined by a group of artists and intellectuals who settled in Mojácar in the early 'sixties, attracted by the magic and bewitchment of the town, and who commercialised the totem which today signifies the whole province of Almería. The best way to see Mojácar is to leave the car in the car park and walk to appreciate the pretty medieval arab arquitecture. From the Platform of the Plaza Nueva we have an impressive view of the Valle de las Pirámides. From this we can see that Mojácar la Vieja, the first prehistoric settlemet of Mojácar, was built on the side of the river "Aguas" whose estuary is found on Mojácar beach, this part being a protected area. In the square we can find the Ermita de los Dolores dated from the 18C. From here we can reach The Mirador Castillo, the highest point of the Village. It is really worth spending some time looking at the magnificent view of the Mojácar Coastline. Back down to the square we take the street called "Alcalde Jacinto" up to the Church Santa Maria (1560), originally a fortress made of huge stone slabs, its sober interior open to the public at the usual times of worship. In front of the church we find the marble statue of the Mojaquera, wearing the typical dress, her face covered in the arab style. She is carrying the water container used to bring the same from the well. At the side of the church we find a stairway leading down to the Plaza del Parterre, which was the old arab cementary. Here is the street "En medio" which follows the old blindary wall that protected the higher part of the village. We now reach the Town Hall Square, with its magnificent old tree, brought from the Americas. Walk from here to the City Door - Puerta de la Almedina is the arab inscription - with its archway (15C) which shows the coat of arms of Mojácar. 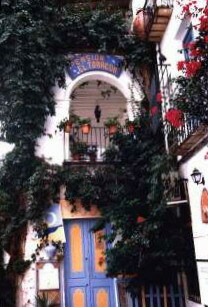 At the side of the archway we find the Casa del Terreón, the old lodge for paying the taxes to enter the town. Its actual design dates from 18C. From here we arrive in the Plaza de las Flores, into the old Jewish Quarter, with its labyrinth of tiny streets. We can return to the archway by way of the streets called Guardia, Puntica, Embajadores with their beautiful sea views, or take the lower road, Cuesta de la Fuente, a beautiful winding road to arrive at the old pathway to the Fuente Mora (well) remodelled and retaining. Some women can still be found doing their washing by hand. From the 12 old taps we can drink some refreshing water. An important part of Mojácar's history is written on the Monument. From the Fuente, we can catch the local bus, back to Mojácar or to the beach. From La Marina de la Torre to Sopalmo and the Granatilla beach, Mojácar's coast is 17 kilometres of shoreline - from empty coves to bustling beaches. Marina de la Torre, in front of a golf course, is around two kilometres of white sandy coastline, removed from the urban sprawl. The mouth of the River Aguas offers an extended sandy beach which continues along the coast as La Rumina. The Descargador and Vista de los Angeles beaches offer quiet sunbathing with some installations and services. El Cantal is the most popular of all our beaches, with a large variety of installations, beach bars and the like. Similarly, the Cueva del Lobo and Ventanicas beaches are popular with visitors, although the sand here is courser: once again, these are full service beaches. Mojácar has wisely protected other beaches - including some of the most dramatic ones - from any development - such as Macenas, Cala del Peñon, Cala del Sombrerico, Bordenares, El Lance and the final cove of the municipality to the west, Cala Granatilla. Situated in the south eastern province of Almería, Mojácar enjoys an excellent location: protected from behind by the Cabrera mountain range and overlooking the warm Mediterranean sea. This southerly location, the proximity to the Africa continent and the high surrounding ranges all contribute to keeping any cloudy fronts away, while the warm Mediterranean assures Mojácar of an exceptional subtropical climate. Temperatures are kind the year round, with an average of 21º Celsius. This agreeable climate allows for an abundance of wild flowers and herbs, such as thyme, lavender and esparto grass. In the dry river causeways and moister areas we find bamboo, tamarisk and rosebay. Cultivations of almond, olive, carob, fig and orange trees intermix with prickly pair, century plants, palms and delightful bouganvillas, all contributing towards Mojácar's singular charm as well as playing host to a large variety of birds such as linnets, swifts, green finches, wood larks, hoopoes, magpies, partridges and so on. In the wet areas at the mouth of the River Aguas, flocks of migratory birds can sometimes be observed, such as herons, flamingos and sandpipers. Rare and protected fauna locally include the Greek Tortoise and the Martin. Common mammals include wild boar, foxes, rabbits and hares. Mojácar offers a rich variety of regional and international dishes to awaken and delight all her guests. The traditional fare, born from rural and Moorish skills, continues strongly. From both the sea and the nearby orchards comes a rich variety of materials bringing such simple delights as fresh fish on the hot plate, and such traditional dishes as our stews, soups and savouries. National and international cuisine is also well represented in our many fine restaurants. The coming of night is a special experience. From the setting of the sun over the mountains, delicately tinting the town in shades of pink and silvering the sea below, Mojácar captures our souls and brings us out to enjoy the mystical streets of the town. We are lured into discovering hidden treasures at every turn. The moon, our host, hovers over romantic dinners, relaxed conversations and candlelit engagements while music rooted in Arab traditions mixes gently with more modern interpretations from a full range on international night spots to appeal to all ages. Mojácar has a full range of concerts, exhibitions and shows: framed in exceptional locales such as her legendary fountain, her charming plazas or along her coastline. Mojácar's nights have always held a special thrall - an irresistible attraction that mutates to our own characters and ages: welcoming us always as an active part of the magic and cosmopolitan atmosphere. Mojácar is dressed for the evening, clad with beautiful jewels, and ready to whisper legends into our willing ears as she invites us to join her subjects as they flit from fiesta to fiesta and from one delightful corner to another: gathering new friends along the way. Dawn finally overtakes us with its extraordinary beauty and a new reminder of Mojácar's natural vitality. Graced by her climate, this corner of Spain's south-east can offer a variety of means of enjoying ourselves in a natural setting all the year round. We can drop below the surface of the warm Mediterranean with undersea sports, and it is almost always calm enough to water-ski above, to go boating, canoeing, fishing, swimming or sunbathing alongside on the sandy beaches. Stronger sensations can be enjoyed with ultralite fly-bys, parachuting, jet-skis or a race against your friends with go-karts. Hikers get to know our secrets and natural marvels. For other adventurers, there is the opportunity to explore by horse riding or on mountain bikes. Certain hotel-run installations offer tennis and lawn bowls while 10 magnificent golf courses are available year round for play. Not far away, we have pot-holing in a gigantic underground system and several four wheel drive racetracks.